December 1, 2014 – Chef Brigitte Nguyen here to share some tips for celebrating the holidays on a budget! As an avid baker, caterer, and TV chef, I do a ton of entertaining, cooking and baking this time of year. It feels like there’s an office potluck, luncheon, or holiday cooking demo every other day and I love it! Time and money can become hot commodities during the holidays. These sweet deals at ALDI have saved me plenty of both. Ready-Made Desserts: Whether straight from the box (hello, Specially Selected Cheesecake Sampler and Baklava!) or very simply doctored up, ALDI desserts can really bail you out when you’re short on time and don’t want to spend $25-50 on a dessert from a fancy bakery. I like to spread fruit preserves on the Specially Selected Italian Mascarpone Torta and top it with fresh berries. I also have grand plans to turn the Specially Selected Mini Eclairs into a croquembouche (a tower of cream puffs) held together with melted Andes mints. Stocking Stuffers: Pizzelles, rolled wafer cookies and any of the awesome chocolate bars make for inexpensive, special stocking stuffers. I was super excited to see sea salt dark chocolate caramels, biscotti, torino cookies and caramel wafers for the holidays. I love to raid the aisle with the traditional German Christmas sweets like stollen, spekulatius, lebkuchen and pfeffernüsse. My sister lived in Berlin where she loved shopping at ALDI, so I’m surprising her with a giant basket of her favorite German treats. Baking Staples: Butter, cream cheese, canned pumpkin – you name it; it’s always a great buy at ALDI. Pricier baking ingredients like chocolate, nuts, dried fruit and extracts can really add up at other stores. You can even find Christmas sprinkles and icing for your little baking elves to decorate cookies. ’Tis the season for cookie exchanges and baking marathons, so stock that pantry and be ready to open the bakeshop with a moment’s notice. Speaking of cookie exchanges, I attend one every year and a couple of the girls are gluten-free and don’t get to take home nearly the variety of loot that the rest of us do. 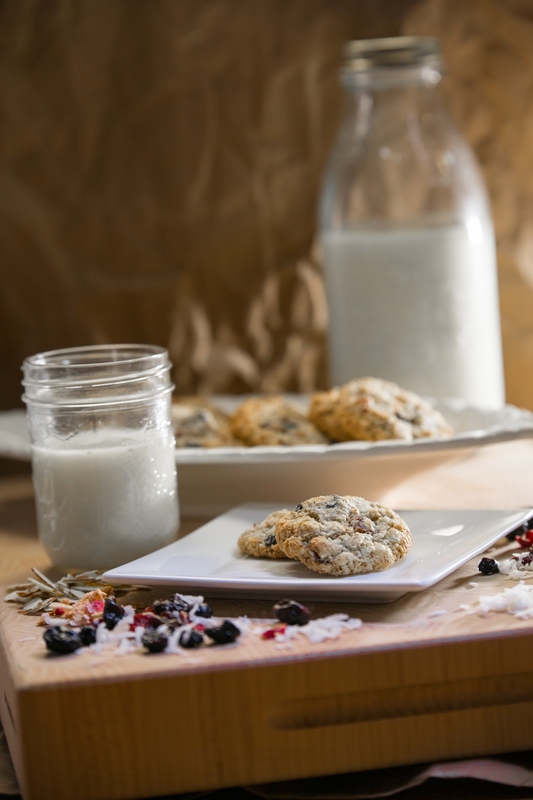 I developed a super easy, versatile recipe for gluten-free cookies that are nutty, chewy and crispy. I grind my own almond flour and throw in some coconut and granola from the liveGfree line. These are great for office gatherings or the kids’ classroom parties so no one is left out. They also keep well, so throw them in a tin for homemade gift giving! In the bowl of a food processor, grind the almonds to form a fine flour, being careful not to over process and turn the nuts into butter. Transfer to a medium bowl. Place the coconut flakes into the food processor and pulse 10-12 times to cut them into smaller bits. Add to the almond flour, along with baking soda and salt. In the bowl of a mixer, beat the butter and sugar until combined and fluffy. Add the egg and extracts and beat to combine. Add the almond flour mixture to the bowl and mix to form a dough. Lastly, add the dried fruit, granola, and white chocolate. Scoop and roll the dough onto parchment-lined baking sheets by the tablespoonful, spacing cookies 2 inches apart. Bake for 10-12 minutes, until lightly browned on the edges. Cool completely on the baking sheets before transferring to an airtight container. Sorry I will miss CHRISTMAS in Lexington! Come January I will be more than ready to taste all this delicious food! Great chef Bridgitte with Great ideas! Sounds delicious, and healthy! Thanks for the ideas. I’m have no creativity in the kitchen! Haven’t made them myself, but I heard they’re incredible. Plan to try. Nice photos, by the way — they’re making me hungry. glad to see a GF cookie recipe without a bunch of strange, pricey flours. can’t wait to try! I can’t wait to make the cranberry cookies! I love that they are on the healthy side too !! Thank u for the great easy treats !! Perfect holiday treat for my GF friends! Keep the yummy recipes coming Chef Brigitte!! Even though I readily eat all the gluten I can get my hands on – several of my friends and family are gluten sensitive. I’ll definitely make this for my next holiday gathering – then everyone can join in on the over indulging! Love the stocking stuffer ideas and quick tips for gatherings. Thanks chef Brigitte!! a croquembouche with melted Andes mints???? What?? That sounds amazing, might have to make an Aldi run to try it!!! Please, please an Aldi store in Mobile.or Pensacola. Please, you would make me a happy women. Thanks.